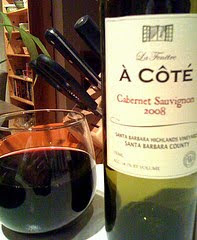 One of the treasures I picked up at a recent Wally's tent sale is a Santa Barbara County Cabernet from La Fenêtre. À Côté is a delicious wine, 100% Cabernet Sauvignon from the Santa Barbara Highlands. The grapes grow above the fog line, where the Cab gets ridiculous in Santa Barbara County. Sommelier-turned-winemaker Joshua Klapper did some fine work getting this in a bottle. The fruit is wonderful, nicely abetted by its time in french oak. The nose is all about smokey, leathery, dark fruit up front. A bit of barnyard appeared to my senses on the second night it was open, but it smoothed out before I had a chance to second-sniff it. A leathery quality shrouds the fruit on the palate, to my delight. I taste blackberry and currant strongly. On the third night, graphite really made its presence known. Over the span of three nights during which I enjoyed À Côté, I'd say it drank good, then better, then wow.